Justin Long wear black low cut Converse “Chuck Taylor” All Stars in the film. The Average Joe’s Gym team runs onto the dodgeball court. 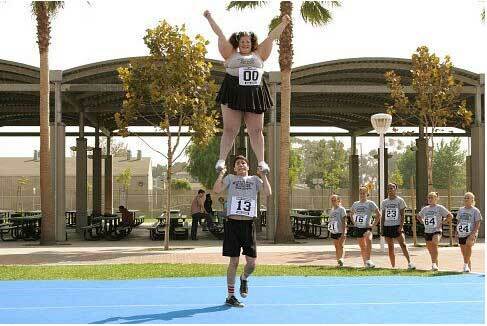 Justin tries to hold up the largest cheerleader during tryouts. La Fleur reluctantly agrees to go along, especially when he discovers that all their team has to do to qualify is to beat a team of girl scouts. Of course, they are immediately wiped out by the girl scouts, who turn out to be relentless opponents full of trickery. But when they officials go to award the prize, the girl’s team is disqualified because a random drug test has determined that their biggest player uses a numbers of illegal substances and steroids. So the Average Joe’s team is on the way to Las Vegas for the national tournament. Furious about this, Goodman puts together his own team with the sole purpose of defeating them. Things look hopeless when suddenly two breaks happen for them. Dodgeball legend Patches O’Houlihan (Rip Torn), now wheelchair bound, appears and volunteers to be their coach. Then Kate, who despises Goodman for making advances at her and also turns out to be a natural dodgeball player, decides to join their team and help them win the money. You can see where the story is going. Their new coach uses a bunch of very unorthodox methods to get the Average Joe’s Gym team ready, and eventually the rival teams meet for their showdown at the National Dodgeball Tournament in Las Vegas. How all of this resolves occupies the balance of the story line. Justin is crushed to the ground by the overweight girl trying out for the cheerleading squad. Dodgeball: A True Underdog Story works as a comedy because it aims low and never stops pummeling the viewer with hilarious bits. It takes on all the cliches of sports films and proceeds to give you a humorous twist on each. It also makes fun of sports organizations: dodgeball is run by the American Dodgeball Association of America and William Shatner is their commisioner; sports television: Extreme Dodgeball is broadcast on ESPN 8, the Ocho, “If it’s almost a sport, we’ve got it here!” (Gary Cole and Jason Bateman give us hilarious performances as the cable network’s announcing team. ); and sports teams: besides the teams from the two gyms, the dodgeball tournament is filled with oddball teams. Writer/Director Rawson Marshall Thurber keeps the pace moving at a pretty fast pace throughout the film, and has given us a lot of humorous twists to the typical storyline and characters that you see in sports films. One of his best touches is the black and white training film on the sport of dodgeball that comes from the 1950’s, introduces us to dodgeball great Patches O’Houlihan, and tells us to observe the five “D’s”, two of which are “Dodge”. White Goodman is a great character for Ben Stiller, because it demands someone who can be over the top all of the time, and Stiller definitely delivers in this film. Vince Vaughn underplays his character, so in the long run you identify with him, since he ends up the most normal while Justin Long shows that he has the depth as an actor to succeed in a comic role. Christine Taylor gives us a perky edge to her roll and provides us with a few surprises beyond the stereotype you expect to see. The other Average Joe’s Gym regulars seem well cast, although we don’t get to know them as well as the people mentioned above. And best of all are a few surprises not revealed here. Dodgeball: A True Underdog Story isn’t a great film, but it sure is a fun movie to watch. White Goodman touts his Globo Gym in a television advertisement. Justin crashes hard to the floor during a tournament qualifying round. Justin Long wears black low cut chucks throughout the film. There are a few closeup shots, but the best scenes involving chucks are the training scenes where the team is put through their paces by Patches O’Houlihan. First you set a series of (painful) closeups as O’Houlihan throws everything he can find right at Justin to get him to learn to duck. A little later you see closeups as Justin runs around a series of chairs. Justin works on his footwork during a practice session run by Patches O’Houlihan. 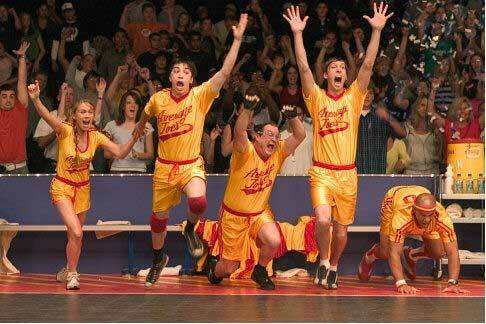 Dodgeball: A True Underdog Story. (2004) Vince Vaughn, Ben Stiller, Christine Taylor, Rip Torn, Justin Long, Stephen Root, Joel Moore, Chris Williams, Alan Tudyk. Written and directed by Rawson Marshall Thurber. Categories: Comedy, Sports.